Carl has been training in the Martial Arts for over 10 years (BJJ/MMA and Boxing), and been in the Crazy Monkey Defense Program (CMD) for 6 years, first as a student, then moving into to an assistant instructor and finally taking over the CMD New Zealand studio. This experience, along with 6 years as a bouncer/doorman in Wellington has given him a unique insight both into the art and self defense aspects of the CMD program. 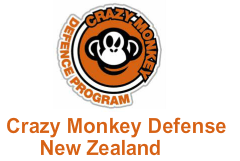 With over 10 years experience in various Martial Arts and four years as a trainer/instructor, I believe the Crazy Monkey Defense Program is the perfect vehicle for clients to learn a functional martial and self defence art that emphasises safety, pushing and challenging yourself. I have a diverse group of clientele ranging from Law Enforcement, Security Personnel, IT Professionals, Corporate groups and everyday people, most of whom are looking to combat stress, get in shape and learn effective self-preservation whilst having fun. At the end of the day, I aim to help people become champions on and off the mats. I am 100% committed to my clientele and what they wish to achieve. Been training for over 10 years in various arts. Using Martial Arts as self expression.